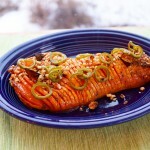 A wonderful recipe for Thanksgiving, Christmas, other holidays, or just for a simple dinner. 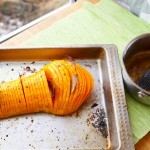 Hasselback is the way to cut the product (ingredient). In this recipe, it’s squash, into thin slices, adding between the cuts some things, in this case, the bay leaf, which gives the flavor and aroma to the dish during cooking. You can also cook potatoes this way (Swedish cuisine), cut halfway through into thin slices and on top add breadcrumbs, butter and/or nuts. You also can cook Hasselback chicken breast, adding to the cuts some herbs, fruits, vegetables, spinach with goat cheese, and etc. It turns out fragrant, juicy, and very tasty. And for dessert, for example, apples Hasselback with a glaze of cinnamon, butter, brown sugar, sprinkled with nuts, chocolate, or oatmeal, and served with ice cream or whipped cream. The spiciness of the glaze in this recipe can be adjusted to your taste, the longer the peppers are cooked in the glaze, the spicier it will be So if you like it hot and spicy, leave the pepper for a couple of minutes longer when preparing the glaze. If you prefer a light spicy taste, remove the seeds from the pepper, cook it in the glaze for a couple of mines, take it out of the pot, and then continue to cook the glaze for another 2-3 more minutes until it thickens. Also, the maple syrup can be replaced with liquid honey, mixed with a little water. 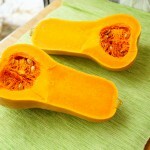 Halve the squash lengthwise, and clean the seeds with a spoon or a small knife. Using a peeler, remove skin and white flesh below. Cover the pan with foil or parchment paper. Rub the halves of squash all over with oil on all sides, put it on a baking tray, the side cut downwards, and sprinkle with salt and pepper. Bake in an oven preheated to 218 'C for about 20 minutes. 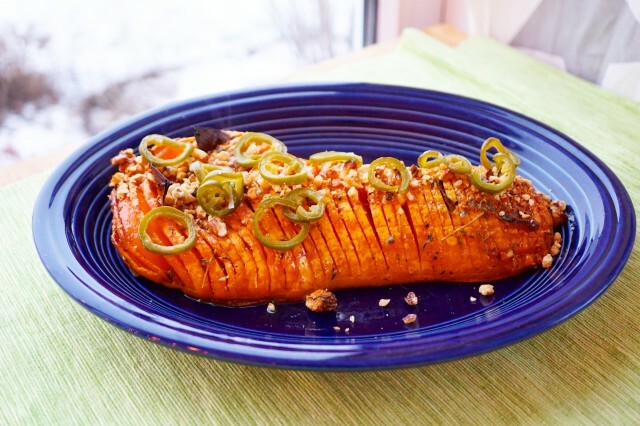 While baking the squash, prepare the glaze: cut into thin slices the jalapeno ( leave the seeds or remove them if you don't like spicy). Pour maple syrup into a small saucepan. 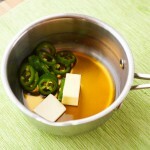 Add butter, jalapenos, thyme leaves, apple cider vinegar, and mix it and cook over a small fire until the glaze thickens, which should take about 6-8 minutes. 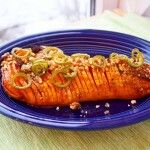 During cooking, try the sauce for the spiciness(carefully, the glaze can be very hot). When the spiciness in the glaze is perfect to your taste, immediately get the peppers out. I cooked mine for about four minutes. Put the peppers on the away, as we will need it at the end for decoration. 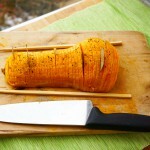 Keep the glaze in a warm place or slightly warm it up every time when you will be basting the squash with the glaze. 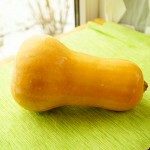 When squash is ready, put it on a cutting board, letting it cool slightly. Put chopsticks or wooden spoons on the sides of squash because it will help you while you are cutting the squash and will prevent your blade from going all the way through as you slice the squash. Cut very thin slits in the squash across with a sharp knife, always being mindful not to go all the way through. Try to make cuts close to each other (about 5-7mm), the thinner the cut, the more beautiful the dish looks at the end. Return the sliced squash to the baking sheet, using two spatulas to help yourself transferring it. Brush with a little glaze on top, tuck bay leaves in between a few of the slices, put it back in the oven and cook for 50-60 minutes, basting with the warm glaze every 10 minutes. Every time when you brush the squash with glaze, make sure that the glaze does not burn around the sides on a baking pan, if it does that, clean the burns with a brush. When it's 10 minutes before it's done, sprinkle on top of the squash chopped walnuts. 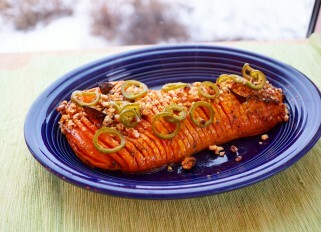 Lay the roast squash on the dish, you can sprinkle more nuts and decorate with cooked jalapeno.